Located in Mentougou on the outskirts of Beijing, the Mount Badhua Nature Reserve is about 120 kilometers from the city proper. The name reserve has misty mountains, running streams, and rare flowers, grasses,anlmals and birds. There you can see the Baihua Grassland, Mount Baihua Waterfall, tall and venerable trees, ancient "sea of stones," fortress and stone pillars by the ice, Golden Toad Worshipping the Moon and Ant Hill. 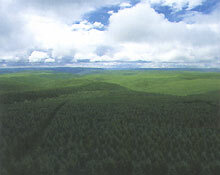 The Baihua Grassland with an area of 1,000 mu, is located on the lop of Mount Baihua. Every spring, surnmer and autumn, if is just like a colorful carpet there, with flowers in full bloom Standing on the lop of Mount Saint after rain, you can see a beautiful picture unfold as the sun rises over the clouds, as they float back and forth. The Mount Baihua Waterfall, 15 meters in width, has a drop of 150 meters.